Shadows to Stardust: E-Books are changing the way we read and the way novelists write. 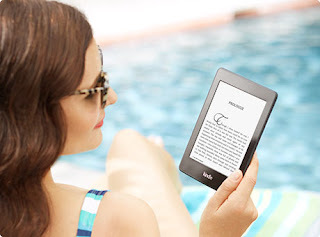 E-Books are changing the way we read and the way novelists write. If you hand me the original paperback edition of Thomas Pynchon’s Gravity’s Rainbow I can, quickly and without too much scrabbling, find you the page where the hero loses the girl. My disappointment on his behalf has lingered physically on that page for the past 20 years. Likewise, in Vasily Grossman’s Life and Fate, there is a long section where a platoon of the Red Army defends “House 6/1”, establishing a temporary zone of political freedom there. For me, this freedom seems to live in that chunk of pages. If I look at the book end-on, I can see, roughly, where House 6/1 exists. Yet with the coming of ebooks, the world of the physical book, read so many times that your imagination can “inhabit” individual pages, is dying. I’m not the only person in my circle who has stopped buying new books in anything other than digital form, and even the cherished books described above are now re-read, when I need to, on Kindle. But what is the ebook doing to the way we read? And how, in turn, are the changes in the way millions of us read going to affect the way novelists write? This is not just a question for academics; you only have to look at people on a beach this summer to see how influential fiction remains, and how, if its narratives were to change radically, our self-conception might also change. This is such an interesting article. I was adamantly against ebooks for a long time. When I received a kindle for Christmas last year, I totally changed my tune. While I still love to read a physical book, ebooks provide me with access to books I would not have otherwise. Hi Ethan, thanks for stopping by, I was the same way when kindles first came out. I've always liked the way a book feels in my hands, the sound of the pages turning, the smell of the paper. I still do, and I still buy physical books, but I also own a kindle fire and really like the convenience it affords me.